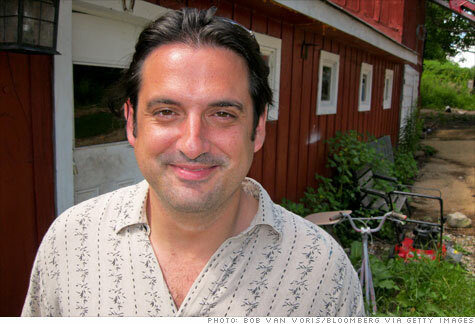 Paul Ceglia lost his lawyers this week in his Facebook fight. NEW YORK (CNNMoney) -- Paul Ceglia's attention-grabbing lawsuit claiming a 50% ownership stake in Facebook is starting to implode -- and on Tuesday, Ceglia's legal team quit. It's unclear whether Manhattan law firm DLA Piper and Buffalo outfit Lippes Mathias Wexler Friedman left the case on their own or were dismissed by Ceglia. In any case, a district court filing on Tuesday showed Ceglia is now represented by San Diego attorney Jeffrey Lake, a sole practitioner. Ceglia, who resides in Wellsville, N.Y., re-filed his claim against Facebook in April with a trail of alleged e-mails between himself and Facebook founder Mark Zuckerberg. He also filed a copy of a contract that he says proves he was handed half the company in April 2003. Facebook has vehemently denied these claims, calling the alleged documents forgeries. "Ceglia's lawsuit is a shell game, shifting and changing with every filing," Orin Snyder, counsel for Zuckerberg and Facebook, recently told CNNMoney. Facebook declined to comment on Ceglia's replacement of his legal team. DLA Piper and Lippes Mathias Wexler Friedman also declined to comment on Wednesday. Jeffrey Lake did not respond to a request. Facebook has acknowledged that Zuckerberg, who often took on programming work-for-hire assignments during his student days, had business dealings with Ceglia. Back in 2003, Ceglia arranged to pay Zuckerberg for development work on a now-defunct site called StreetFax. Ceglia claims the contract also covered work on a fledgling site called "the Face Book," something Zuckerberg strenuously denies. The timelines don't match up: Ceglia's alleged contract is dated several months before Zuckerberg began working on the project that became Facebook. As the year-old case progresses, Ceglia is having trouble providing evidence to back his claims. In April, Ceglia amended his complaint to include dozens of incendiary e-mails between himself and Zuckerberg, allegedly sent between July 2003 and July 2004. But a court filing earlier this month from Ceglia's lawyers said that Ceglia doesn't have the original, digital copies of those e-mails. Instead, he has floppy disks with Microsoft Word documents that contain alleged copy-and-pasted copies of the e-mail messages. Facebook responded in May by blasting the suit as a "a brazen and outrageous fraud" filed by a "convicted felon and well-known scam artist who has spent the last decade of his life ripping people off." The company's filing cited Ceglia's several brushes with the law, including a 1997 felony conviction for possession of 400 grams of a compound found in certain hallucinogenic mushrooms.